Below, Troy, Nordby’s superintendent for the East Rec does more than supervise, schedule and problem solve. He actually does some of the work. 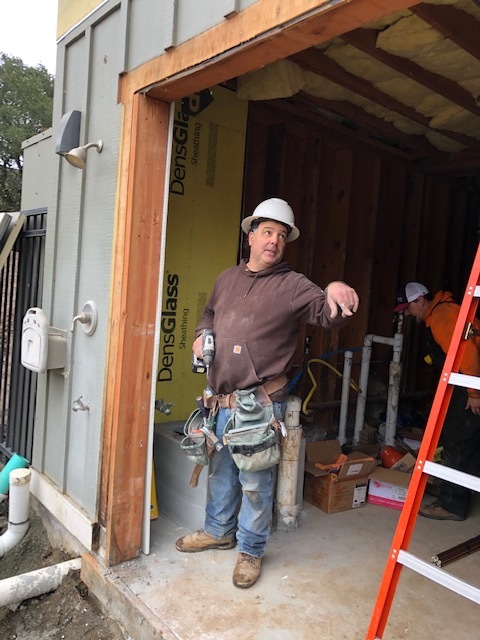 Here he is working on the installation of the weather stripping for the new replacement exterior doors, which are made of fiberglass and are made with a solid core. This type of door can withstand heat and cold without warping and peeling. 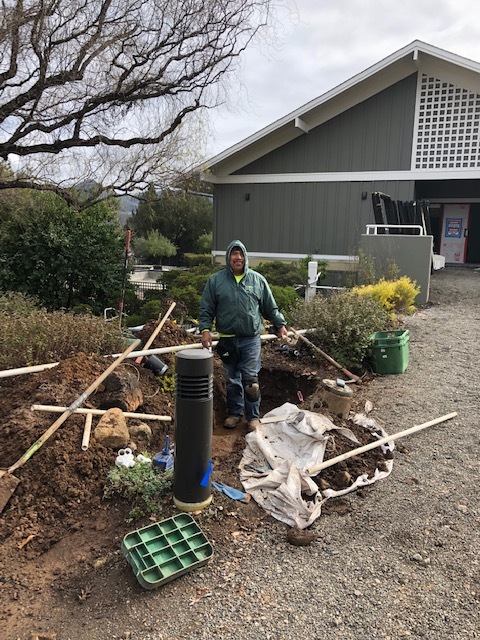 Below, the new direct pathway to the existing concrete steps into the pool area at the auxiliary pool gate entrance is going to be prepared after all of the plant irrigation lines are relocated that are in that path. For those of you who used that front swimming pool entrance, you had to walk toward the East Rec front door, turn left and go down wooden deck steps which transitioned into the concrete steps at the lower landing. When complete, you will be able to walk on the new path directly to the existing concrete steps. 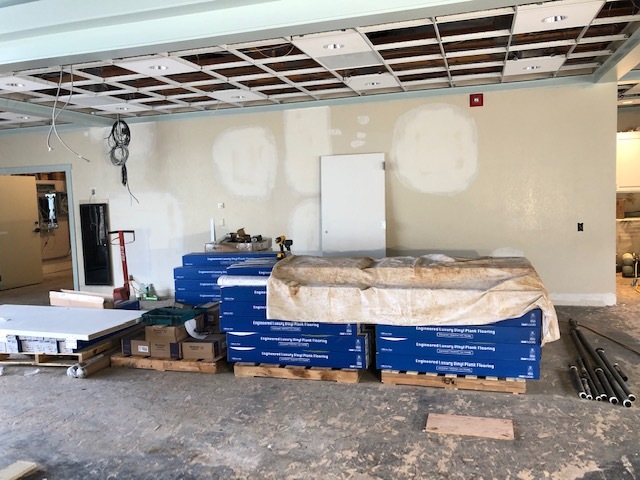 Below in blue wrappers is the new LVP flooring that looks like wood, has a cork underlayment on each piece and can be applied directly to the subfloor after some liquid leveling happens in low spots. Most buildings settle a bit over time or were not all level when constructed originally. 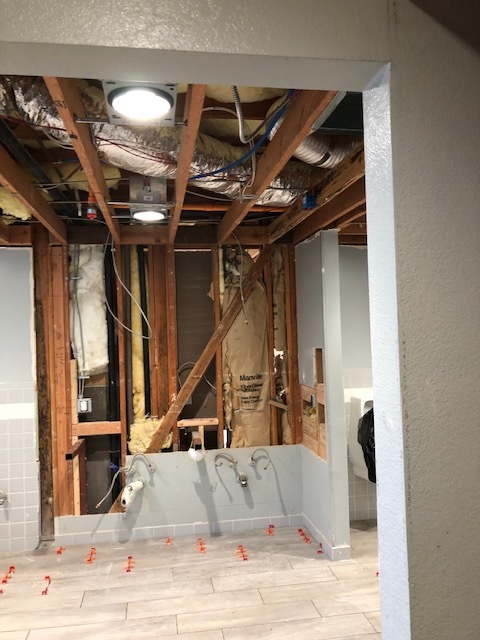 Contractors run into this problem all the time. 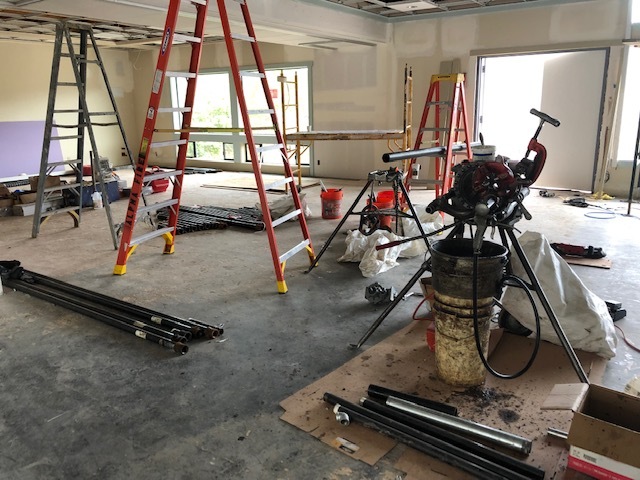 The pipes you see below are part of the fire sprinkler system and the cutting tools on those tripods look somewhat intimidating! The European rolling shutters on the pickleball court side of the building are being installed this week. These give us black out when showing a movie, and also blunt any sound coming from activities on the courts. And, as I mentioned last week, they are one more added step of protection from a fire storm. The steel deck framing is going up. It has been slowed down by the weather. When this is completed you will see the outward curve in the deck, which gives us 150 sq. Ft. Of added space for seating around outside tables which will be there permanently when this job is completed. 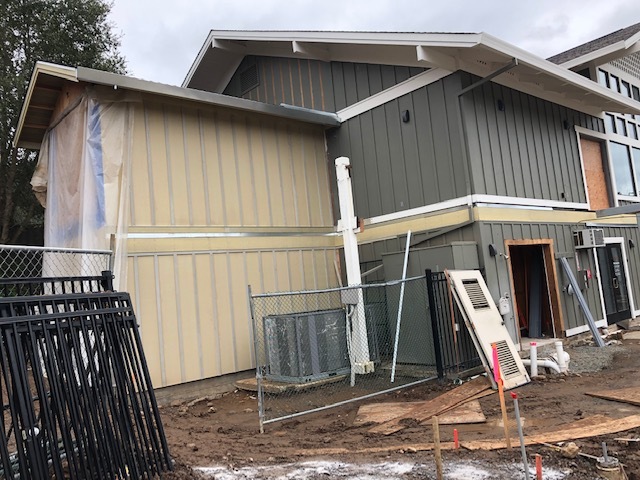 Densglass sheathing (in lieu of sheetrock) is the paintable wall covering for the pool equipment room walls. This product is unaltered in damp conditions, which are prevalent in a pool equipment room. This photo shows the completed two story addition (for the added new pool in the bottom and the storage of chairs upstairs.) you can see the white old pool equipment doors-notice some slats missing? Those doors are very beat up. We are replacing them with doors that are made of sturdier material. Obviously the addition will be painted to match the rest of the existing building. These landscape rocks are free for the taking. They will be hauled away at the end of the job if no one wants them. The old downstairs bath floors sloped toward a floor drain. That slope was too steep to meet ADA compliance. 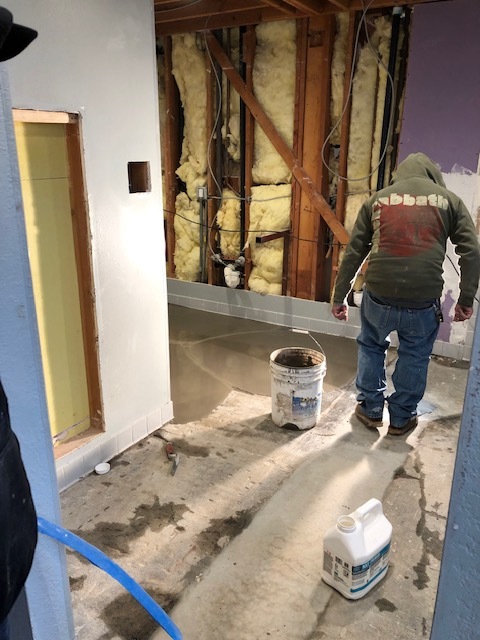 That liquid gray substance you see below is a concrete floor leveling liquid. You pour it on and since water and liquids seek their own level (I learned that in the 8th grade), the floor will become level by doing this procedure. 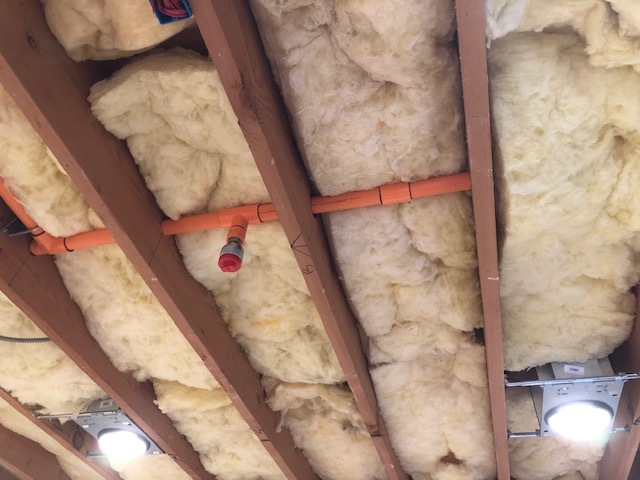 Here are some of the new fire sprinkler lines being installed. 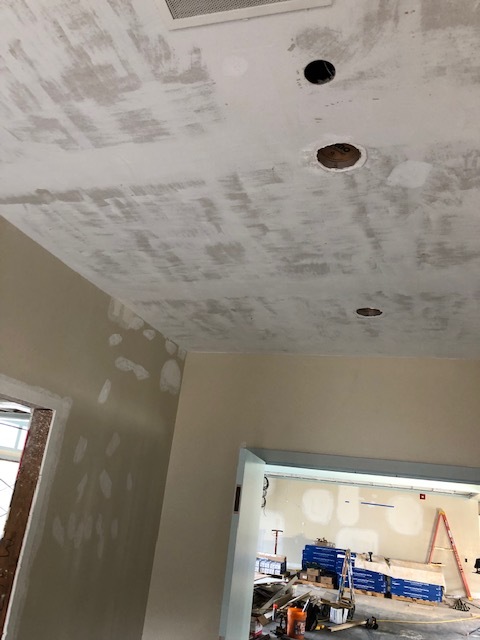 Below is more of the fire sprinkler lines. When these pipes are assembled, they must pass a 200 pound pressure test with water and air combined to pass inspection. Below is the new floor tile being installed in the ladies downstairs locker room. (The men’s locker room tile is complete.) 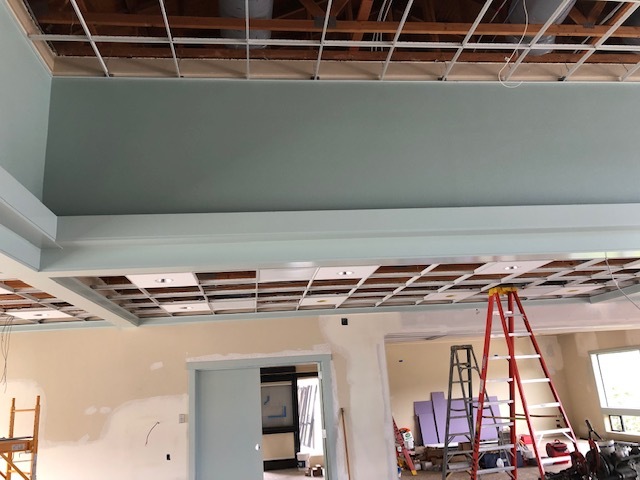 Also notice all of the new ducting in the ceiling. 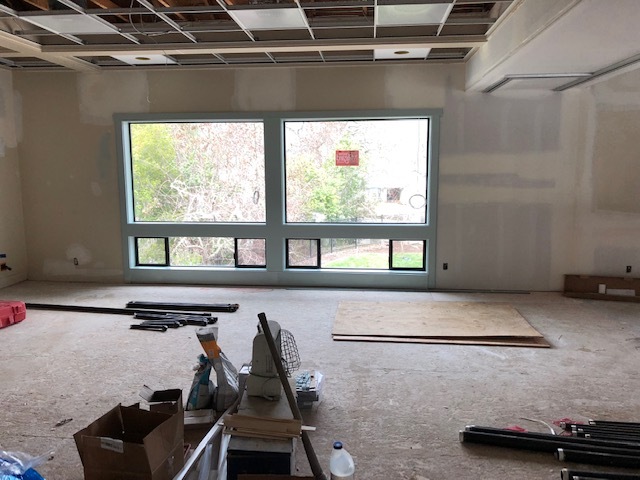 Here is a view of the new windows in the conference room that replaced the sliding doors. 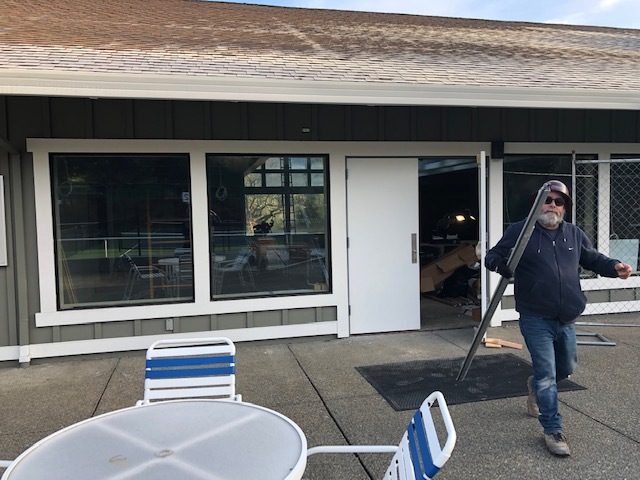 If you remember, there was a wraparound deck there which is now gone, so we needed to change those two openings to windows. The view is still very nice. We kept the opening the same size (saves money and keeps the view) and just filled it with two big picture windows. There are two window venting sections for fresh air at the bottom level of each of these windows. 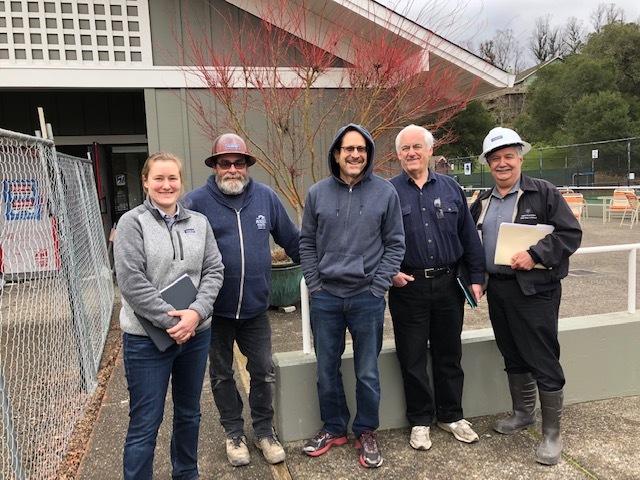 Deanna Alexander, Nordby Project manager, Troy Llopis, Nordby Supt., Steve Spanier, OVA Board President, Tom Kendrick, OVA VP and BCC Liaison, Rick Aubert, OVA Maintenance Mgr. 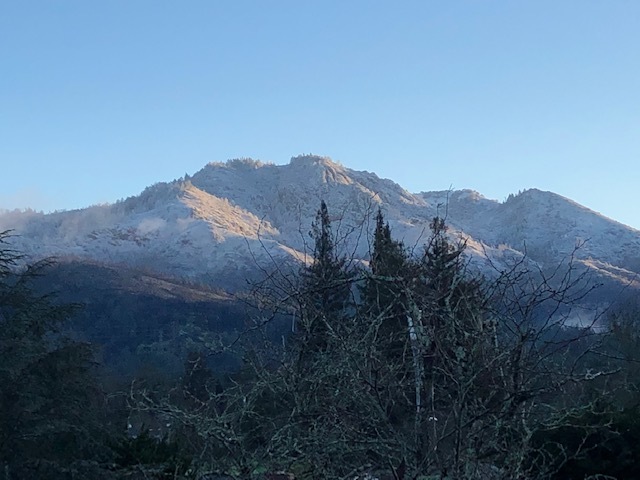 We finally got the release of the fire line upgrade deferred permit after much gnashing of teeth and the encroachment deferred permit will be available in two days. That means the EAST REC parking lot will be CLOSED all next week, (FEB. 18TH THRU 22ND) as we need to dig across the parking lot and then down to the street to connect to the city water main, as we upsize the main water line to the building. We have to do this in order for the fire sprinkler system to function properly in case of emergency. The encroachment permit is the permit to dig into the street where the water line connection is, in order to change the size of the water line. Nordby will be coordinating with the city. Probably Wednesday, 20th or Thursday, 21st the water will be shut off for half a day. We will let you know in advance as this gets firmed up. Everyone wants to know when East Rec will be completed. Obviously the rain has been a slowing factor and continues to affect us. (No more rain dances, please!) 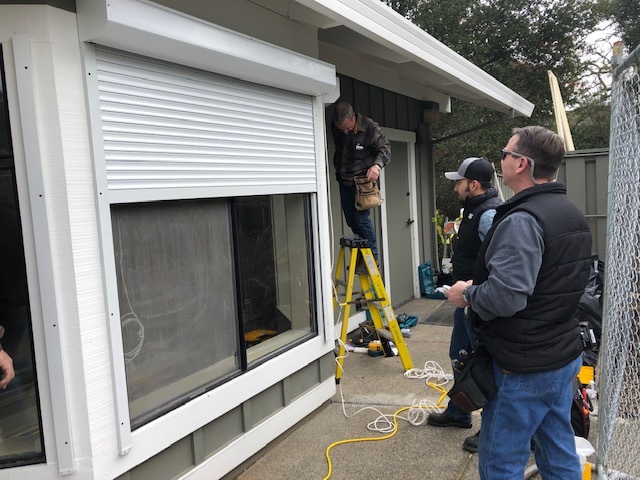 Nordby’s team has been working on some Saturdays to try to make up some lost time and they are looking into overtime of longer days to continue to make up for lost time. We are shooting for Completion in March. So for those clubs scheduling Oakmont events, I have notified Anita Roraus to start scheduling upstairs East Rec events as of April 1st. The downstairs and pool will NOT be available at that time. 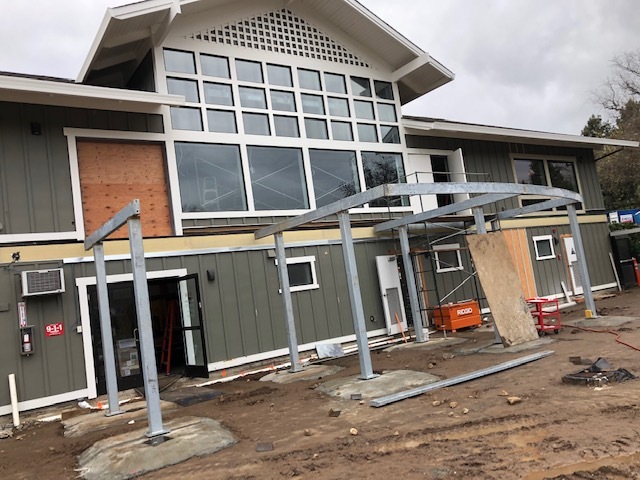 We are applying for a CTO (certificate of temporary occupancy) for the upstairs only, as the weather is keeping us from pouring the concrete pool deck. 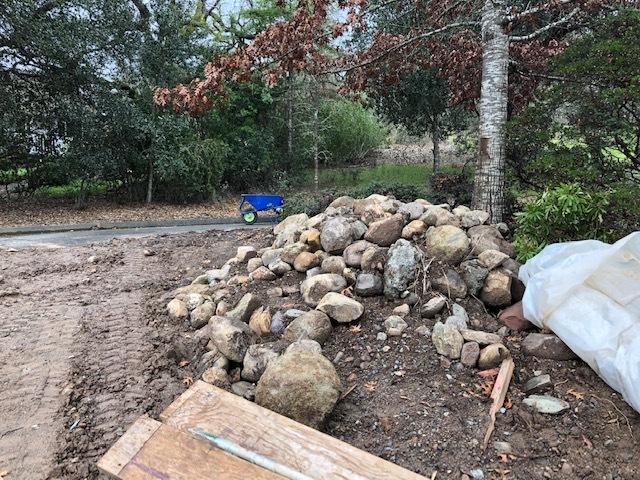 We have a deck pour scheduled for the last week of February, but the soil has to be dry enough and the sun needs to be shining for a certain period of time. In addition to that, the pool has to run with the new salt equipment for 3 weeks after completion, before swimmers can get into the pool. This entry was posted in East Rec Center, Facility Projects. Bookmark the permalink.